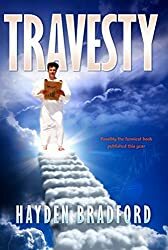 Travesty questions the Christian religion, its writings and theorises on its existence, which provides for a novel that is not only hilarious but thought-provoking and appealing to a broad audience. As the book is written to make people laugh, the author has been careful not to get into any blasphemy. It is a brave and a different style of writing that uses clever prophecies at the end of each chapter. To purchase from your favorite online book store click on the below link. I wrote 'Travesty' for the sheer enjoyment of writing and the therapeutic value to be gained from messing with words. Man oh man, my head needed it.